For those who prefer sparkly wrists, the Access Sofie offers all the bling and then some. The Access Sofie is a beautiful and functional piece of jewelry. It's not as spec-laden as its competition, but it's just as compelling. Wearables aren’t quite the hot commodity they used to be—but at least the Michael Kors Sofie, an Android Wear 2.0 watch from the eponymous fashion house, brings some bling to a flagging tech trend. 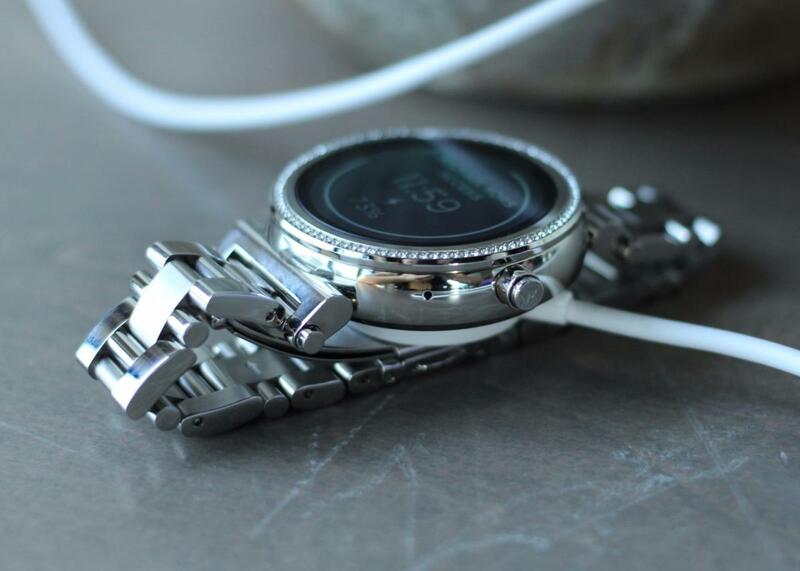 A few years ago, Android-based smartwatches were storming the scene. Manufacturers sparred against one another to deliver the most compelling wearable, and the gear was exciting to cover. But these days, the competition has dwindled. Apple’s keeps its user base relatively satiated with the Apple Watch, while Google’s smartwatch platform is getting more love and attention from lifestyle brands than from tech brands like Samsung, LG and Motorola. Michael Kors was an original purveyor of the Android-as-fashion proposition with its first generation Access line. And now we have the Access Sofie, which possesses quite a bit more pizazz than its predecessor. It’s not a smartwatch made for everyone (if you’re a guy you may prefer the Dylan model), but wearing it will certainly make you feel like someone, if not for the sheer fact that everyone will be looking at your sparkly wrist. The Michael Kors Access Sofie is a blinged-out smartwatch with all the power of Android Wear 2.0. The Sofie’s metal watchband has removable links. Have you ever worn formal attire to a casual gathering? That’s what it’s like wearing the Michael Kors Access Sofie, particularly if you’re not used to a flashy aesthetic. The pave embellishment around the display is beautiful in person, especially under a soft light. But it’s also kind of fancy, which makes it hard to wear as a day-to-day accessory, if you’re not used to that sort of thing. That said, you could easily wear the Sofie to an after-work function, or to work if your office dress code calls for professional attire. The Access Sofie is available in the silver-tone color shown here, and will eventually be available in gold, rose gold, and a sable-tone finish. This is a fancy watch for fancy people, and it may take an extraordinary level of confidence to rock this on a daily basis. This is a fancy watch for fancy people. That said, if you do like the look of this smartwatch, then you’ll appreciate that the Access Sofie is a genuine accessory. It’s weighty like a real mechanical watch, the kind you purchase for a lifetime. The 42mm stainless steel frame doesn’t feel overbearing on the wrist, either, and the side button doesn’t stick out so much that it will bump the top of your hand if you’re bending your wrist. I was comfortable wearing the Access Sofie for consecutive days, though I never slept with it. This is a heavy watch and one that requires an appropriate space on the dresser to charge up for the next day. The Michael Kors Access Sofie charges via a simple magnetic charging pad that connects to any USB charger. The Access Sofie comes with a simple magnetic charging adapter, which can plug into any USB-connected charger you have lying around. The metal-linked wristband is adjustable, too, though you’ll want to acquire the appropriate watch tools before attempting to remove any links. The Access Sofie is also rated IP67 for water resistance, but considering its nearly $400 price tag, it might be the kind of thing you keep away from the perils of the pool. Inside, the Access Sofie runs on a Qualcomm Snapdragon Wear 2100, the same processor that fuels Android Wear’s poster smartwatches, including the LG Watch Style and Watch Sport. There’s also 512MB of RAM—more than you’d get with the Watch Style—as well as 4GB of storage for things like jogging playlists and the like (not that you’d run much with this watch since it’s hefty, and not so pleasant to wear when sweating). The Access Sofie’s 300 mAh battery will last through to the end of the day as long as you manage to set the brightness on the 1.19-inch AMOLED display rather low, and turn off the always-on display. Otherwise, you can easily burn through 20 percent of battery life just during your commute to work. 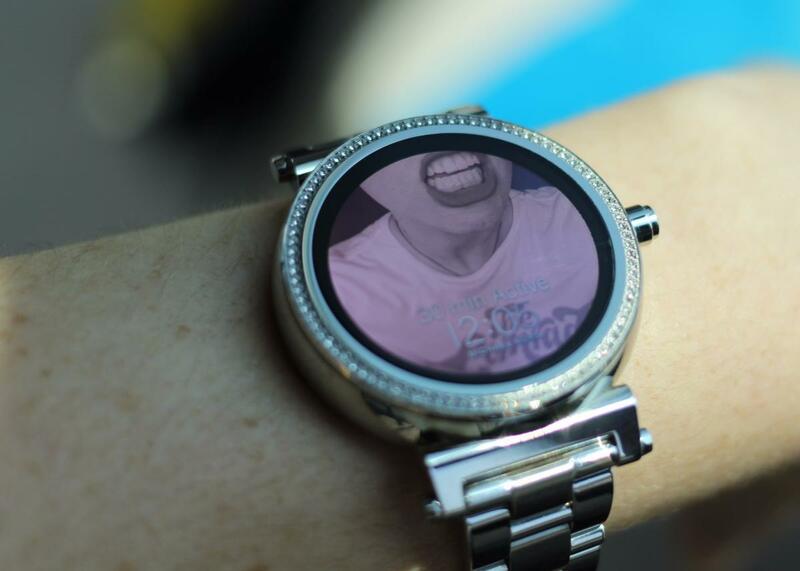 One of the Access Sofie’s watchfaces lets you use your Instagram or Facebook photos as a background, but they’re difficult to see in broad daylight. 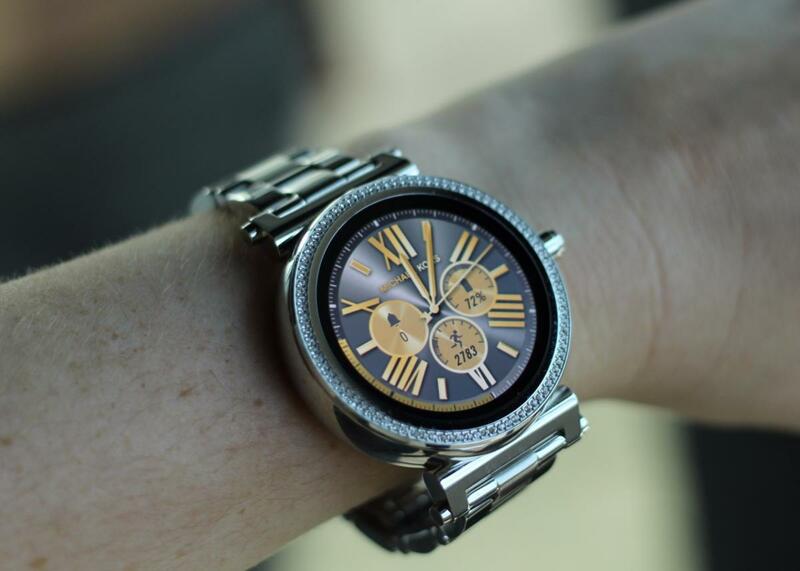 The Michael Kors Access Sofie comes with 19 different watch faces, some of which mirror some of the brand’s actual mechanical watches. Frankly, they’re more attractive than Android Wear’s default bunch, and they match the design of device quite well. Some of the watch faces include smartly placed complications, and a few have animated backgrounds. You can customize the color palette for every watch face, and then save your configuration to wear at a later time. 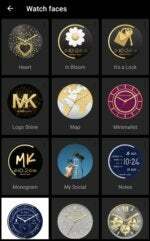 There’s even a function through the preloaded Michael Kors Access app that switches between the watchfaces throughout the day. A sampling of the Michael Kors watchfaces. The Michael Kors Access app also includes a feature called My Social, which doesn’t do much of anything other than choose a photo from your Facebook or Instagram account to display as your background. It can be difficult to see the time in broad daylight with this particular watch face selected, though it’s nice to have the option to use a photo as the background. Of course, since the Access Sofie runs Android Wear 2.0, you’ll also reap all the benefits of features like Google Assistant, Google Maps, and dynamic notifications, as well as the platform’s mini QWERTY keyboard for replying to messages (it works quite well!). The Access Sofie doesn’t have all the bells and whistles of its more utilitarian competition. 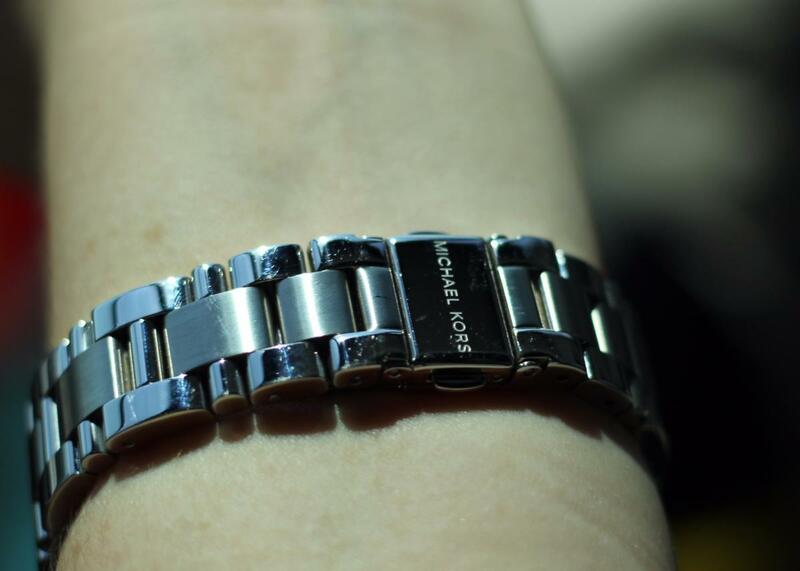 There’s no NFC here—probably because Michael Kors didn’t watch to bulk up the watch. There’s also no cellular connectivity or heart rate monitor, though the Access Sofie does fine with tracking daily activity and connecting to your smartphone via Bluetooth. A pretty smartwatch for pretty people. The Michael Kors Access Sofie is a stunning device that’s manages to marry form with function, though aside from the display, there’s nothing about this smartwatch that suggests it’s a piece of technology. Rather, the Access Sofie comes across as a polished piece of jewelry, and the abilities of Android Wear merely feel like value-added features. 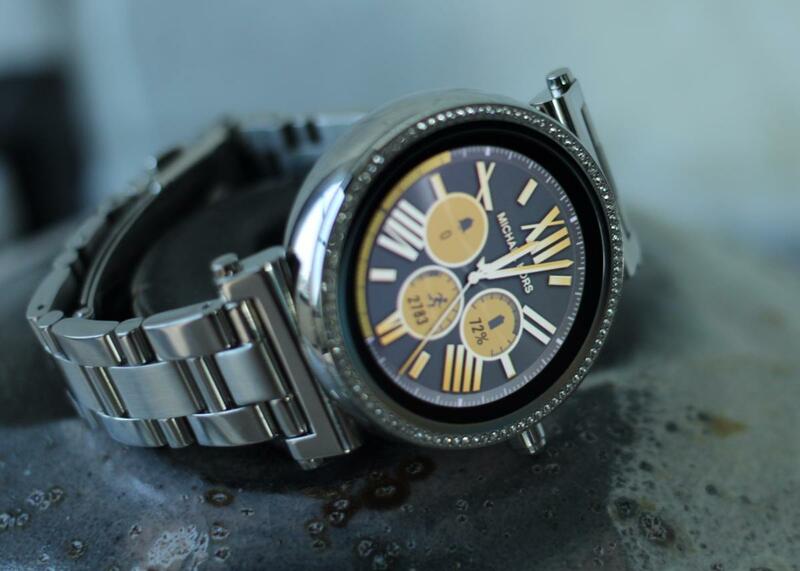 Its look isn’t for everyone, however, and considering it’s $350 starting price tag, the Access Sofie is a watch aimed at high-fashion tech-dabblers rather than tech-first enthusiasts. But overall, the Access Sofie is a solid choice for an Android Wear smartwatch simply because it’s a good watch. It’s speedy, it charges fast, and its battery will last you through most of your busy days. The future of the Android Wear platform is clearly with the fashion brands, and the Access Sofie is a prime example of how this technology is being appropriately integrated into everyday accessories. With the power of Android Wear 2.0 fueling it, the super stylish Access Sofie is a prime example of how to appropriately implement wearable technology into everyday accessories. Florence reports on all the latest Android and smart home gear for PCWorld, Greenbot and TechHive. Follow her on Twitter at @ohthatflo.